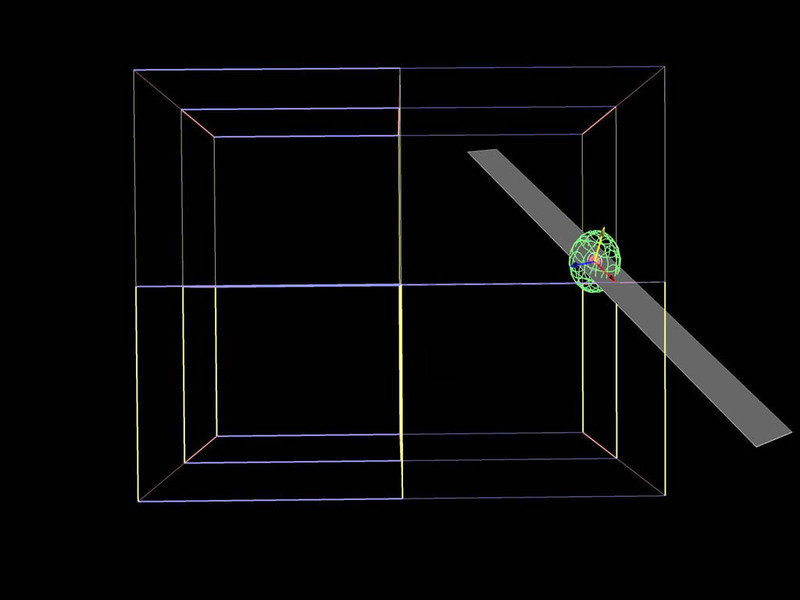 We want to start with a simple translation of motion data into the virtual space. The Polhemus tracking system is delivering position and orientation data for single sensors. We simply connect the sensor data to the spatial transformation of a basic geometric primitive. 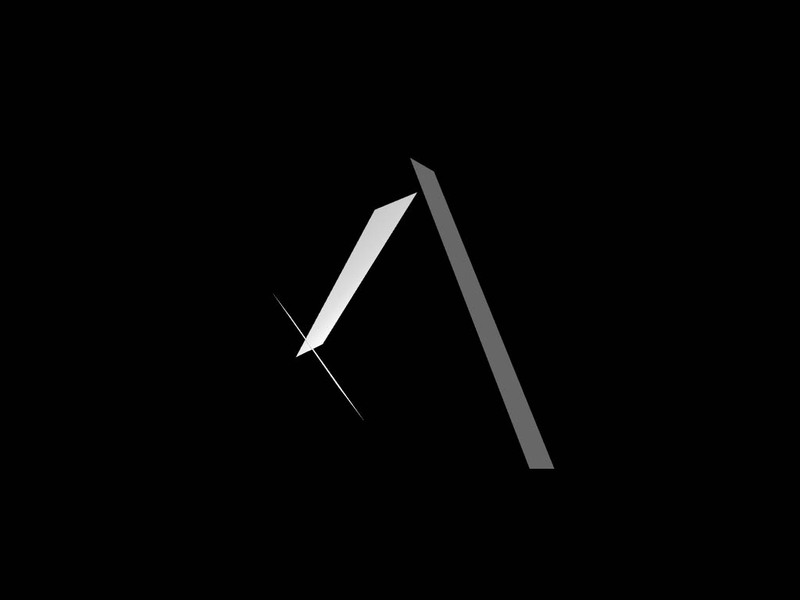 The screen shows now a simplified abstraction of a motion. Since the computer can store the data it is receiving, it can recall it at any time. 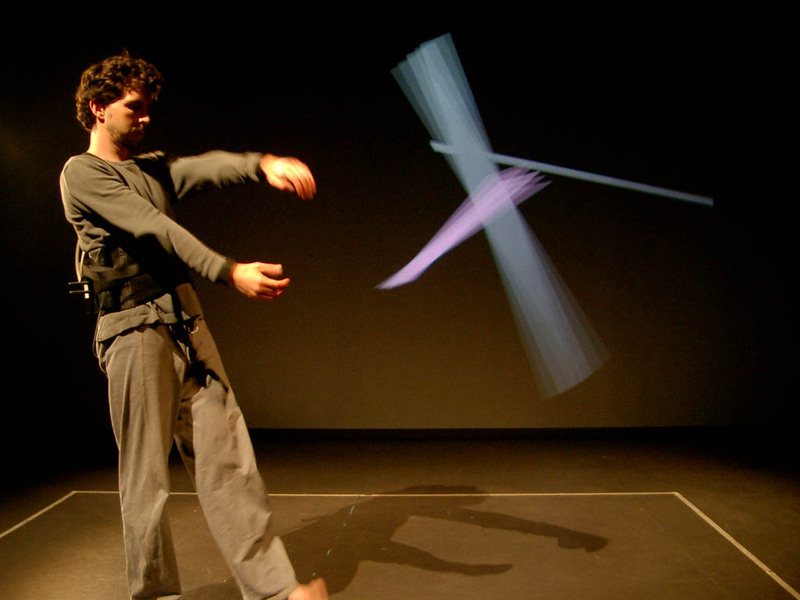 What is the difference in perceiving a real time motion and a recorded motion? To enhance the expected difference, we overlay recorded motions with motions linked to the real time data. Position and direction of the virtual plank is changed by the movement of the dancer's left hand. After one minute a second plank and later a third plank appears. Apart from the currently triggered plank short recordings of a moving plank are played back as a loop. A composition of present and past time is established. We decided to work with an incorrect/ buggy implementation of the sensor orientation because it produces more complex object motions than a direct mapping. We notice that it is helpful to start out with very simple and sometimes repetitive movements in order to establish the connection between the body movement and the projected plank. This is due to the fact that even a small movement would be amplified very strongly. Even a slight twist of the hand without moving it from its point in space results in the plank rotating around its axis. At times Nik also tries to keep in mind where he has moved the plank that is attached to his sensor and step around it. So here a kind of feedback is happening that goes beyond the direct translation of one body part (wrist) to one graphic object (plank). About one minute into the video a second and later a third plank appear. These are sequences of the moving plank that have just been recorded and are then played back immediately as a short loop. These memorized planks appear next to the currently triggered plank. At that point Nik starts taking the rhythm that is suggested by the short loops into his movement as well as using the position of the recorded planks as an input for his next movement. This leads to making some compositional decisions, approaching a spatial and temporal canon of the three planks. As an observer one can hardly help but look for the connections between the body and the object that is moved by it, even though we realized that some of the compositions happened as a coincidence and are not planned or controlled. If we look at the position Nik is in at 30 seconds into the video-example, there seems to be a clear relation between the planks' and his right arm position. Actually, the sensor is attached to the other, his left arm. This can be compared to improvising with another dancer. Sometimes a moment comes up that was not planned by either of the two partners. It turns out that the visual representation of the past motion by a single object incites one to treat it like an additional partner. This leads to the assumption that there is no qualitative difference between the presence of the real-time controlled and the replayed controlled object. The one plank is as connected to the present sensor data as the other plank is to the past. To overcome the object's role of a fictive partner and concentrate on the quality of the motion, we changed the setup to . The Sensor is attached to the dancer's left hand. 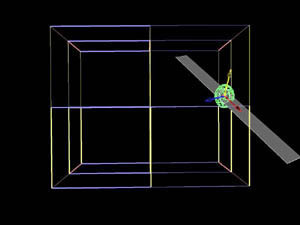 The position and orientation of the sensor is controlling the position and orientation of a scaled cube. The cube is scaled with clearly distinct scaling factors along its local axes to clarify its own orientation in space. 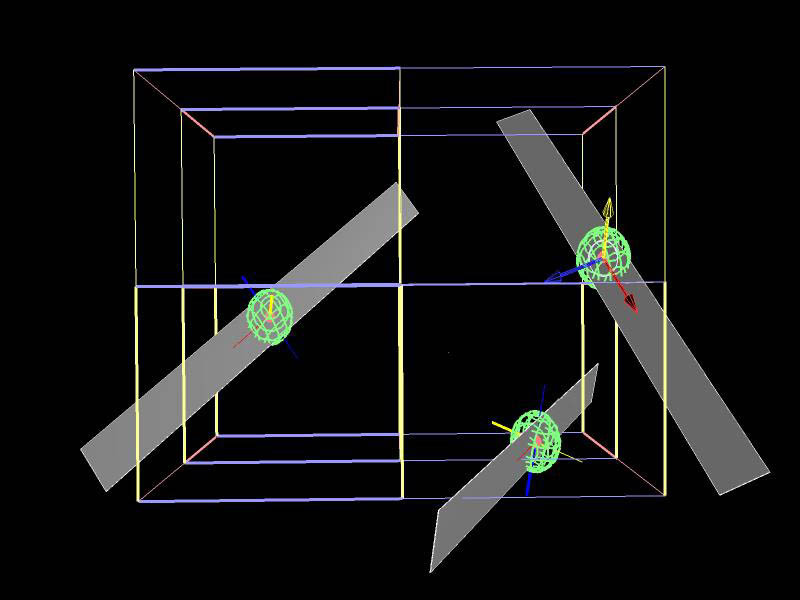 The Technical Screenshots below show the sensor as a green wire frame sphere at the origin of the cube. The RF Button is attached to the dancer's right hand. A button press starts the recording of the data while the cube is still controlled by the sensor. The next button press finishes the recording. A new additional cube appears on the screen, which is controlled by the looped playback of the recorded data. This process can be repeated an infinite amount of times, each time a new cube being added to the ensemble.